Excellent movie. Bravo to Dr. Bennet Amalu for his amazing work. All parents should read up on his findings before considering in sending their children in a sport such as football. Will Smith did an amazing job as did the rest of the cast. I was certainly enlightened but upset to know that nobody is taking this seriously!!! Very good movie! Interesting, well written, well acted. Excellent movie. The entire cast was exceptional. Will Smith will get an Oscar nomination for his performance. Excellent movie! Best I've seen in a while. Excellent movie ! Kudos to Will Smith-great acting chops! Excellent movie. Inspiring, enlightening, Oscar nods for sure! Recommend highly! Great movie! Loved Will Smith in this one! No wonder the NFL didn't want this movie to be made! Excellent performance of will smith. Excellent movie. Go see it to find out how big cooperations like the NFL hide the truth and undermine the brilliant minds that need recognition and praise for finding out the truth in order to save lives. Excellent, excellent!! Never a lull, beautifully directed and acted. Will Smith is SURE to get a Best Actor Nomination and should get the Oscar in my opinion. Better than we expected, loved it! Powerful performance by Will Smith. The behind the scenes look at covering the interests of the NFL is convincing. The league will not want to be associated with this movie. Good film but will have a very limited audience base that would enjoy this topic. Brilliant. 5 stars. Will Smith was awesome. Wonderful script. Definitely makes one see the game of football differently. I thought the movie was excellent. Will Smith was brilliant. WOW... what a great movie and the casts were wonderful... Will Smith should get an Oscar nom for this one. Excellent movie. Very informative. Dr. Bennet Omalu is a hero, values lives instead of worshiping the almighty dollar. Shame on the NFL higher ups for sweeping this under the rug. Wonderful cast, Will, Alec, Gugu, David and Albert all put out great performances. Go see it, I want to see it again. Love football but this movie brings to reality the ugly way corporations like the NFL care more about profits then the players. Will Smith really acted brilliantly, great job by all cast members. Excellent movie. Wow, Will Smith sure has developed as an actor - he is great in this movie. I like this kind of movie. Will Smith is excellent as Dr. Omalu. Great support cast also. Will Smith does it again with this amazing movie. 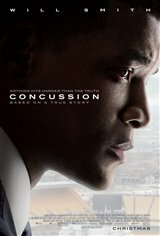 Concussion was a good movie Will Smith did an outstanding job and I believe this is a film that most people will enjoy. Especially football fans and fans of the NFL. This movie was also very informative and brought light to key issues within the league. This is a very good movie. Will Smith did an excellent job. I liked this film a lot. It spoke the truth about traumatic brain injury in football players. Will Smith is wonderful in this part. It's a complex story and needs to be told. Outstanding! Smith's performance is Oscar worthy for best actor. I have been to the Screening of Concussion and found the acting exceptional. The Story holds your attention all the way through. Might be Oscar material? ?